Adaptability* Powers up moves of the same type. Moves with the same type as this Pokemon become more powerful. Ruby/Sapphire While FEEBAS�s body is in tatters, it has a hardy and tenacious life force that enables it to live anywhere. 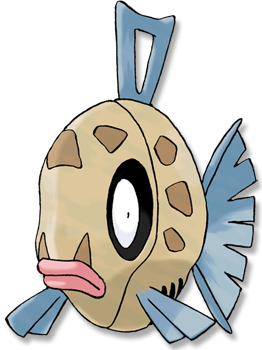 However, this POK�MON is also slow and dimwitted, making it an easy catch. Emerald FEEBAS live in ponds that are heavily infested with weeds. Because of its hopelessly shabby appearance, it seems as if few TRAINERS raise it. FireRed Ridiculed for its shabby appearance, it is ignored by researchers. It lives in ponds choked with weeds. Leaf Green Ridiculed for its shabby appearance, it is ignored by researchers. It lives in ponds choked with weeds. Diamond/Pearl It eats anything, so it can even live in polluted streams and lakes. No one pays any attention to it. Platinum It is a shabby and ugly Pok�mon. However, it is very hardy and can survive on little water. Heart Gold It is the shabbiest Pok�mon of all. It forms in schools and lives at the bottom of rivers. Soul Silver It is the shabbiest Pok�mon of all. It forms in schools and lives at the bottom of rivers. Black It is a shabby and ugly Pok�mon. However, it is very hardy and can survive on little water. White It is a shabby and ugly Pok�mon. However, it is very hardy and can survive on little water.